There seems to be some characters that don't really sell all that well, but are favorites of writers and artists. Over at Marvel Comics, Dr. Strange seems to be a prime example of this, having had several series over his many decades of existence. 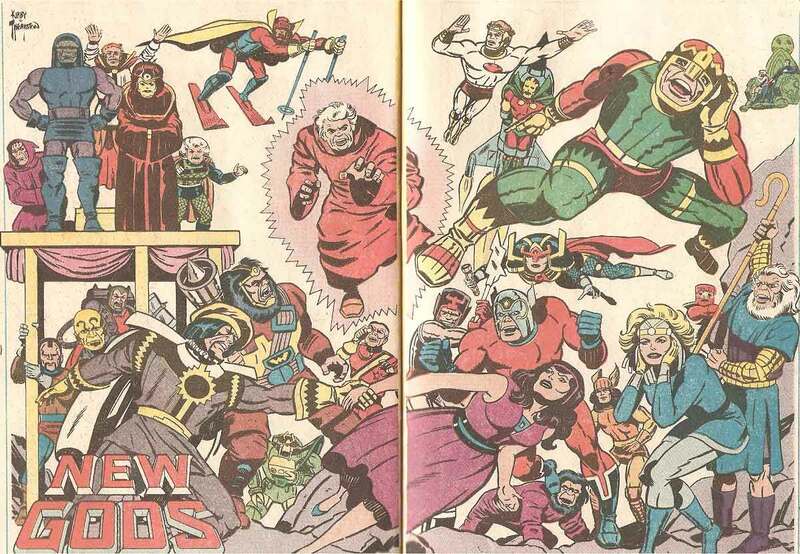 Over at DC, the usual suspects seem to be Jack Kirby's New Gods, which include Darkseid, Mr. Miracle, Orion, and Big Barda, who make up Jack Kirby's Fourth World saga. Walt Simonson has stated that of all the things Jack Kirby's ever done, the Fourth World is his favorite — and that says a lot considering that Walt's first comics were Kirby Thor comics, and that Walt made his name on Thor. When you watch the DC animated universe, specifically Superman and Justice League (Unlimited), you can see how much Bruce Timm, Paul Dini, and company love these characters. What's Wrong With the New Gods? Going through the Jack Kirby's Fourth World Omnibus editions, of which there are four, it's easy to see what's so appealing about the New Gods. 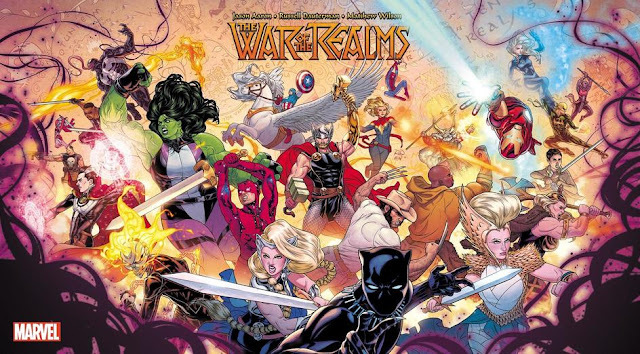 I for one am really into it when mythology mixes with the superhero motif, and Thor and Wonder Woman are two of my favorite superheroes. The basic construction of the Fourth World is impressive in itself. There came a time when the Old Gods died and two worlds were born from the destruction. One world, New Genesis, was full of life and goodness, while the other world, Apokolips, was a steaming planet of fire pits and was full of oppression and evil. The rulers of both worlds, Izaya the Highfather and deadly Darkseid, were tired of their ongoing war at some point, and declared peace by trading sons. Darkseid gave Orion over to Izaya, and Izaya gave Scott Free, who would later become Mr. Miracle, the Ultimate Escape Artist, to Darkseid. Such moves gave the story its mythical flavor, as, for lack of a better word, illogical stuff like that is commonplace in myths. The story in which this is detailed, "The Pact" in New Gods #7 (the same issue that calls the entire saga a "tapestry"), is said to be Kirby's favorite story among everything he'd ever done. 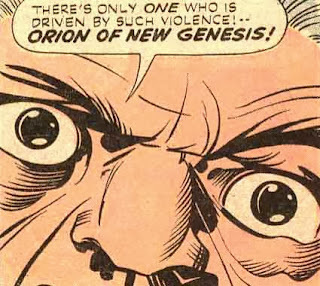 New Gods, which really focused on Orion and his war against Darkseid, but probed more into the other New Gods of New Genesis as well. Mr. Miracle, which focused on Scott Free, who escaped from the clutches of Darkseid and went to Earth to work as an escape artist. 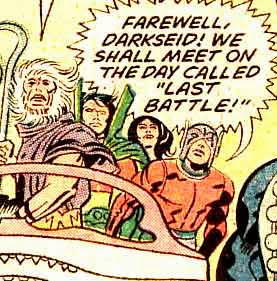 Of course, the forces of Darkseid followed him. He works with his girlfriend Big Barda of Apokolips, Barda's Fighting Furies, his assistant Oberon, and protege Shilo Norman. Mr. Miracle is the most successful of the original Fourth World titles, lasting 18 issues while the others only lasted 11 each. 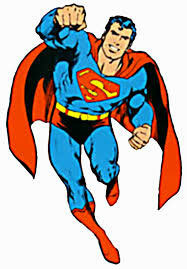 Superman's Pal, Jimmy Olsen, which Kirby agreed to take on in exchange for launching the three new titles. It's actually in this series that Darkseid makes his first appearance, but as it's Jimmy Olsen, Superman appears in quite a good portion of it. It's here that Cadmus, the genetics labortatory that's become ubiquitous in most Superman comics since, was introduced, and the Newsboy Legion, featuring some child characters from the 40s that Kirby did with Joe Simon, reappeared. (Another Simon/Kirby creation, the Guardian, reappeared here too.) It also highlighted the silly side of things, and even featured Don Rickles for a couple of issues. From the basic construction of the concept alone, you can see Kirby's literary aspirations and artistic ambitions. Aside from the very elaborate mechanics of how New Genesis and Apokolips worked and interacted, Kirby even named most of his characters to be allusions to something with more cache. Izaya evokes the biblical Isiah. Orion is named after the Greek huntsman and the constellation. Desaad the torturer takes his name from the Marquis De Sade. Kalibak, the monstrous son of Darkseid, is reminiscent of Caliban, the monstrous man from Shakespeare's The Tempest. Esak, one of the children of New Genesis, is evocative of Isaac. And even the villain, Darkseid, and the font of the New Gods' power and being, The Source, seem to prefigure George Lucas' Dark Side and The Force, from Star Wars. The four titles ran concurrently and were built up with a specific vision, and it was like nothing ever seen before, and it's not something that's been tried a lot since. (In fact, I can only think of one example of the top of my head: Grant Morrison's Seven Soldiers of Victory.) I think a lot of it was uneven — not surprising when you consider that Kirby was not really used to scripting, but that none of this had been so much as attempted prior to the Fourth World. There were times when you could assume that in terms of coordinating, Jack was in over his head as well. As Glen David Gold said in his introduction to the third Omnibus, Kalibak comes to Earth in New Gods #5, and he's not seen again until #8, as if Kirby wrote in his introduction, forgot about it, then saw the actual comic on the stands and said, "Whoa, I gotta get back to that!" In fact, I think that it's easy to see what creative types find so appealing about Kirby's Fourth World — its scope, its aspirations, its allusions, and the fact that no one drew machines or fights like Kirby — but I also think the project was far from perfect. It scope went unexplored, its aspirations were just that, and its allusions didn't go far beyond alluding. In short, it was full of potential that went unfulfilled. But how could that potential possibly have been fulfilled? It was a brand new experiment, one that required a lot of time in a serial medium. And that was something it didn't get. After only 11 issues of New Gods and The Forever People and 18 issues of Mr. Miracle, the saga was discontinued. Kirby was given a chance in 1985 to end the Fourth World saga with the original graphic novel The Hunger Dogs, but considering that he never even got past Act 1 in the original run, it was doomed to failure. 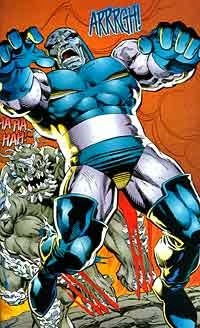 He had planned for a long, sprawling epic that ended with Orion and Darkseid killing each other, and was told to rush the ending into one book when the beginning had barely taken off, and to keep Orion and Darkseid alive for marketing purposes. This isn't even mentioning that he wasn't the same Jack Kirby anymore, and he wasn't coming from the same place creatively, so the final product was even stilted and almost unreadable on its own (although it did feature some pretty Kirby art, with innovative layouts and a new, different method of coloring, at least for mainstream comics). So I think a lot of the problems with the Fourth World can be traced back to the way the original run worked. It was untested, the first of its kind, and poorly coordinated. For all that people like to work with that source material, it is full of problems, partly because it remained so unfinished. On the flipside, Simonson posits that this is partly what gives the work its power, and that if it ended, then that would be it. This way, Apokolips and New Genesis are at war forever. There's something to that, certainly, in the same way that some of the most adaptable characters from the Golden Age (Superman, Batman, Captain America) don't seem to really be the same as the more critically acclaimed characters from the Golden Age (The Spirit, Captain Marvel, Plastic Man). It seems that the more concrete and canonized nature may remove some adaptability. But to be honest, I think the biggest problem the New Gods have ever had, in terms of storytelling and standing on their own, is this guy. 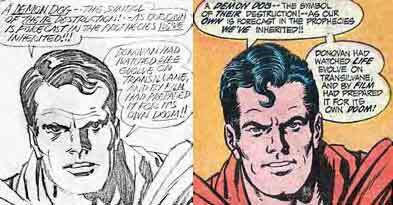 I'm not even saying that I like Kirby's Superman (left), but if you're going to redraw it, at least ask the man to redraw it. "Hey, Jack, can you give us the S curl?" Superman sticks out like a sore thumb, visually and narratively, in Kirby's Fourth World, but at least he was relegated to the Jimmy Olsen book, in which they introduced Cadmus, the Earth-based laboratory where they did genetic research. (Superman also showed up in the first issue of Forever People, but there he was a point-of-view character and not really a main character. He was used to establish the cast.) At the very least, when Jack was writing the books, the main characters were still the New Gods. 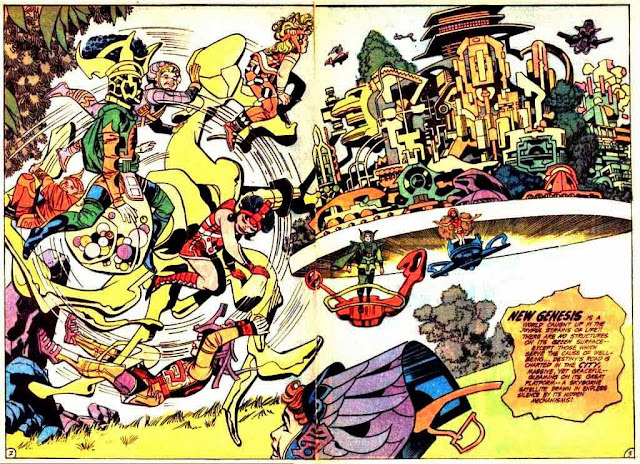 Orion and Lightray took center stage in New Gods, Mr. Miracle and Big Barda in Mister Miracle, the hippie-like Forever people in their own title. Those three titles felt significantly more connected to each other than Jimmy Olsen, so at least it's a little removed. There's a bit of a disconnect. But after Kirby left and the characters were revived later on, DC decided to fold them more into the fabric of the main universe. There's a Justice League/Justice Society crossover where Orion contacts the heroes to fight the forces of Apokolips. In John Byrne's Superman and Wonder Woman runs and his Legends miniseries, Darkseid is played up as a really powerful bad guy, the "Big Bad" as it were, to Superman/Wonder Woman. As a result, Orion and the rest not only seem demoted from "gods" to "regular superheroes" (Miracle, Orion, Barda, and Lightray also all at one point or another joined the Justice League) but they seem to take a backseat to Superman and the gang. To be fair, it's not like the gods of New Genesis were portrayed as incompetent, but they did end up with reduced roles and they no longer felt like the stars of their own epics. It was pretty clear in Kirby's stuff that said epic would culminate in the final battle between Orion and Darkseid, but in the bigger scheme of things afterward, it felt like that battle was reserved for Superman. And it seems, to me, that the main appeal of that is because Darkseid is the most threatening villain in DC's entire lineup. Even the Superman animated series and the Justice League (Unlimited) follow-ups co-opted Darkseid as the biggest, baddest Superman villain. That's not only unfair to the rest of the Fourth World characters, but it's also unfair to the Fourth World saga. But more, I also think it's damaging to Darkseid. The cartoons used him sparingly — just once against Superman in the middle of the show's run to set up the final confrontation, and once in the series closer; just once in Justice League to re-establish Superman as a force, and once more in the series finale. In both cases, Darkseid is the ultimate villain in the literal sense — he's the last villain. So I think, in his function as Superman's bad guy, Darkseid should be used sparingly, but he hasn't been. And that's a danger that comes with a serialized ongoing medium with no plans to end things. Some villains, you just can't use too much. You can't bring Galactus back too often; he would lose what makes him threatening. Apocalypse looks threatening, then you realize he keeps losing. Thanos had to be kept from losing what made him threatening that they had to explain it away as a psychological flaw that he sabotaged himself each time. Darkseid is one of those villains. He talks a big game, but every single time he fails at something, he loses more of his cache. As a result, I actually think that Darkseid is one of the single most undertapped villains in all of fiction. In other words, it seems that the Fourth World has been marginalized in an effort to make Darkseid the main threat to Superman (and the DC Universe), but even that hasn't panned out, and it culminated in the 2008 DC event, Final Crisis, where the New Gods were basically "killed" or "reset" and shunted off into a universe of their own. I thought this was a good idea, because I think there is a whole lot of potential in the Fourth World characters, but that to really meet that potential they had to be their own focus. They had to take center stage in their own story. Of course, DC rebooted its line in September 2011 so that was never built on (Darkseid and Orion have already shown up in various books). But I still think the concept is sound. I think that story's just begging to be told, because Kirby never had a chance to really tell it. I think that there are many creators who would want to work on it and I think DC could ensure it sells well with the right amount of marketing. Unfortunately, when it's been tried, it hasn't lasted long, as in the case, for example, of Walt Simonson's Orion run, which seems to get a lot of love from the Internet among the people who have actually read it. (DC won't even collect past the fifth issue.) But maybe that's a solution, since I think it's the kind of project you can skip over single issues for and go straight to paperback form — kinda the equivalent of putting a new live-action series on Netflix right away instead of throwing it to the networks and waiting for it to find an audience — because the story would be so dense, so packed. And if not in comics? Then maybe a cartoon would be where they finally get their story told. Maybe even the movies. Maybe something else. On the web, maybe? But wherever they tell it, wherever Orion and Darkseid have their final battle, should it ever happen, I just hope it's far enough away from Superman. It's a fair review of the Fourth World, and yet I have to say that I more or less completely disagree with you. The original series was fantastic straight across the board, the 1980's mini-series and the GN the Hunger Dogs are great reads if not the end of the series we had been basically promised. And the characters and over-all mythology of the Fourth World is easily one of the best constructed fantasy universes ever created. Again, different tastes for different people. I'm a huge fan of the Fourth World. I wrote a blog post about "Death of the New Gods" which I thought was brilliant. I agree, they were never truly given their deserved and proper attention. The New God's tetralogy failed because Jack Kirby was a terrible writer (his dialogue was excruciatingly painful to read). Since he was his own editor, he had no one to correct his shortcomings in plotting, coordination of titles or character development. Worst of all, when his titles failed (and they all did except Kamandi) he always blamed someone else. Instead of a little self-examination, whereby he might've learned from his mistakes and changed course, he kept plowing ahead with the same product and seeing it discontinued (The Demon, Omac). As an artist/conceptualizer, Jack Kirby was one of the the all-time greats. As a one man show he was unsuccessful and unimpressive. Keythd23, TOTALLY AND COMPLETELY DISAGREE!! Jack Kirby on his own as a one man show was UNTOUCHABLE! In his prime and the Fourth World is Kirby in his prime, his artwork and ideas were the best in comics! That's during the time he was a one man show! There's absolutely no excuse for there not being a live action New Gods Movie! You won't find a better villian than Darkseid. In fact the Fourth World is absolutely filled with fantastic villians, just imagine the movies that could be made! Animated movies as well, I'd absolutely love to see Kamandi done by Pixar, the way they did the Incredibles! The King gave DC a goldmine and they aren't really using it. I'm glad to see that Steppenwolf is the villian for the new Justice League movie, so maybe they've finally pulled their heads out and will really give the Fourth World the attention that it more than deserves! Because there's absolutely nothing wrong with these characters, some of the very best characters in the history of comics! I've never understood the criticism of his writing? Who would know better how these ALIENS would sound and talk? Nothing says success and great writing like one failed title after another. The graveyard of Jack Kirby's post 1970 one man show: The New Gods, Mr. Miracle, The Forever People, The Demon, OMAC, The Eternals, Devil Dinosaur, Machine Man, Silver Star, Captain Universe. Kamandi hung on for a while after he left but it too was discontinued. Not only was Kirby unable to make his Fourth World saga successful but many other talented individuals have tried to revive The New God's, etc. to no avail. I believe in showing respect to someone with an opposing viewpoint. But when someone says such blatantly stupid things as you did in the face of all evidence to the contrary I have to call you out for the idiot you obviously are.